I love Dairugger XV, and apparently so do bootleg toy makers, because years after the original toys were released, they continue to make new bootlegs of the character. The latest one is a high quality knockoff of the 1982 Chogokin DX Armor Combination GB-72 made by Popy. This is not the large plastic that was brought to the US as Voltron 1, this is the mid-size diecast transforming version. There already was a bootleg of this back in the 80s, but that was more of an exact copy. This appears to be a brand new mold of a toy created almost thirty years ago. The card is bright and large in typical bootleg fashion. 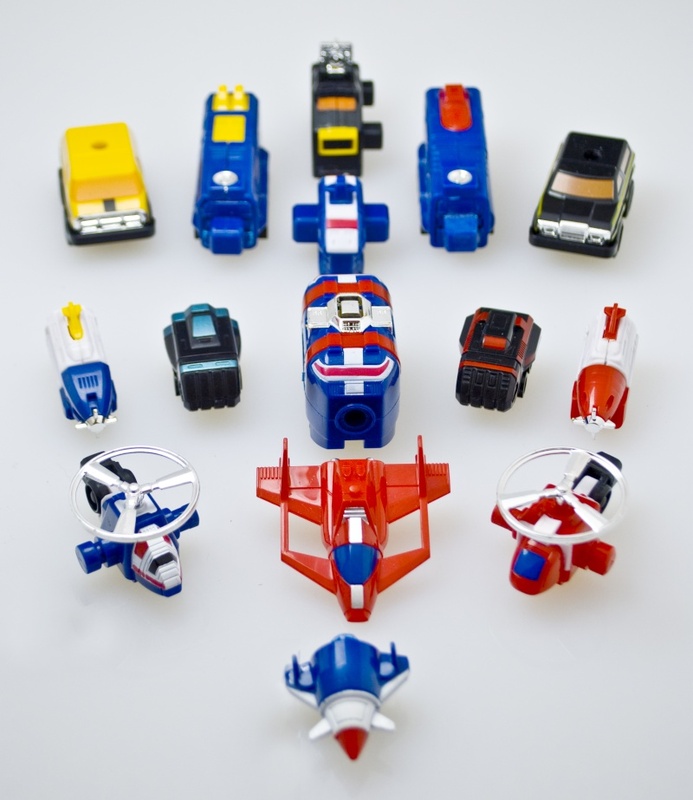 Along with images of Dairugger there are also some random transformers thrown in for good measure. The back has instructions from the real set, which unfortunately do not apply here. While there is no diecast, the thing is incredibly well made. The plastic is high quality, the molding is sharp, and the paint apps are great. If you've ever handled the original GB-72 you will know it's a bit of a floppy mess. This is just the opposite! This is actually a great toy! However there are a few drawbacks. There's no metal, and most of the wheels are non-moving. The toy comes packaged with the hands and the feet on the wrong sides. To fix this, you can just swap the feet but the hands need to be unscrewed and re-attached to the opposite side. This toy does disassemble, but not completely. You cannot form the three distinct vehicle teams. The head is not removable from the body, and the hands do not separate from the shoulders. Many of the moving mechanisms required for combination are gone. But while you sacrifice this feature, you gain a great, solid action figure with great articulation. Dairugger XV comes with a nice chrome sword. Bootlegs come and go and this one recently appeared on the scene in early 2011, are pretty common on ebay. if you want one, grab one now as they likely won't be around forever. Then again, with the multitude of Dairugger bootlegs around, who knows? I have always liked Voltron I the best. I'm about to get me one of these from another collector who sells his. You can modify him to be more accurate. I modified my Dairugger XV. Using a spare set and some styrene and you can make this toy separate into all 15 forms and more importantly combine into the three teams.